Berthouds Mule Team Express, PD 25¢, two-line rectangular framed handstamp frank at left on 3¢ pink (U59) buff entire to Philadelphia Pa., entered mails with blue "Treasure City, Nev. Sep 13" cds duplexed with circular grid cancel, Philadelphia (9.20) arrival backstamp; reduced at left from opening, F.-V.F. and rare, Thomas WC6650; signed Frajola as genuine. Thomas No. BRT-700 Estimate $1,000 - 1,500. ONE OF ONLY TWO RECORDED EXAMPLES OF THE BERTHOUDS MULE TEAM EXPRESS FRANK. Silver was discovered in this area in 1867 and by November of that year, the first cabins were built on Treasure Hill. Treasure City was founded in 1868 in the White Pine Mining District and within a year had a population of 6000. The town reached its peak in 1869. By 1870, most of the population began to leave town, due to the lack of good ore. The business district was destroyed by fire in 1874 and never rebuilt. Very little is known about this express. 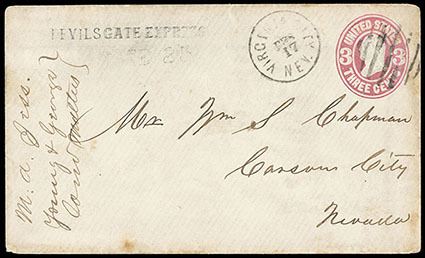 Devil's Gate Express, Paid 25, two-line frank handstamp with unlisted larger "Paid 25" (31mm) lightly struck on 3¢ pink (U58) entire cancelled by circular grid, matching "Virginia City, Nev. Feb 17" cds to Carson City Nev.; partial flap, F.-V.F. and scarce, Only 8 recorded examples of this express are recorded., ex-Barkhausen. This Express operated from the Devil's Gate district of Nevada Territory to Virginia City and Carson City. They picked up letters alone the road and carried them for 25 cents each to the nearest post office. Cover was picked up by Devil's Gate Express and posted at Virginia City to Carson City, Nevada. 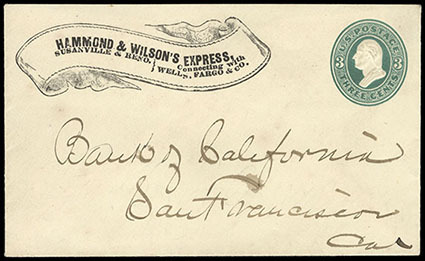 Hammond & Wilson's Express/Susanville and Reno/Connecting with Wells, Fargo & Co., printed scroll frank on fresh 1874 3¢ green entire to San Francisco, fresh and Very Fine, a rare express line lasting only a few months. 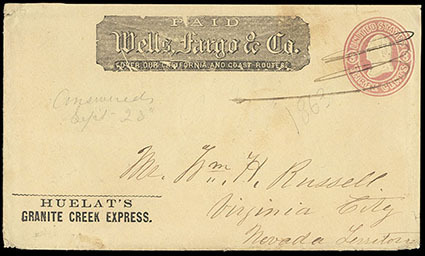 Huelat's Granite Creek Express, printed frank at bottom left of pen cancelled 3¢ pink (U35) buff entire with printed "Wells, Fargo & Co." frank to William H. Russell, Virginia City, Nev. Terr., pencil "1863" dating, fragment of letter datelined "Independence, June 30th 1863" in different hand of addressing accompanies, Very Fine and rare, ex-Jacobitz, Peacre, Edwards, Blaine. Thomas No. HUE-001 Estimate $2,000 - 3,000. THE ONLY RECORDED EXAMPLE OF THE HUELAT'S GRANITE CREEK EXPRESS FRANK. Jabez Huelat was proprietor of Granite Creek Express, from southeast Oregon to Virginia City, Nevada Territory in 1863, and then to Ruby City, Idaho Territory in 1864 and 1865. Letter datelined Independence (Oregon). Humboldt Express Co. "Paid - 50 Cents", two-line imprint frank on 3¢ pink (U35) buff entire to Jamestown Cal., cancelled by blue "Wells, Fargo & Co., Starr City N.t., Nov 16" oval datestamp; repaired with three flaps added and cover mend affecting "Co." of frank,cover expertly rebacked, Fine appearance and rare conjunctive use, Thomas WC8141, ex Dale-Lichtenstein, Whitington. Thomas No. HUM-001 Estimate $1,000 - 1,500. 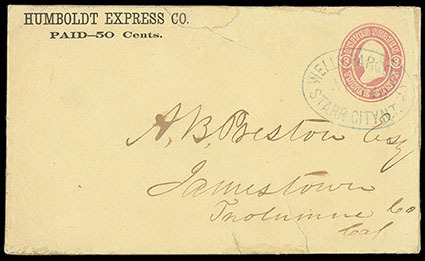 THE ONLY RECORDED USED EXAMPLE OF THIS HUMBOLDT EXPRESS CO. "PAID -50 CENTS." FRANK. Humboldt Express Company was created in August 1864 as a consolidation of Cutler & Westerfield and Blake & McCommons. They originally operated from Idaho City to San Francisco with pony express service to Starr City, Nevada Territory and the Boise Basin. They connected with Wells, Fargo at Starr City. The express folded in 1865 due to the Paiute-Bannock Indian uprising that stopped all service in the Northern Nevada area. A 50¢ surcharge was added on mail from the Basin and South Boise Mines only. This cover from the Boise Area carried by Humboldt Express to Starr City and turned over to Wells, Fargo & Company for delivery to Jamestown, Cal. 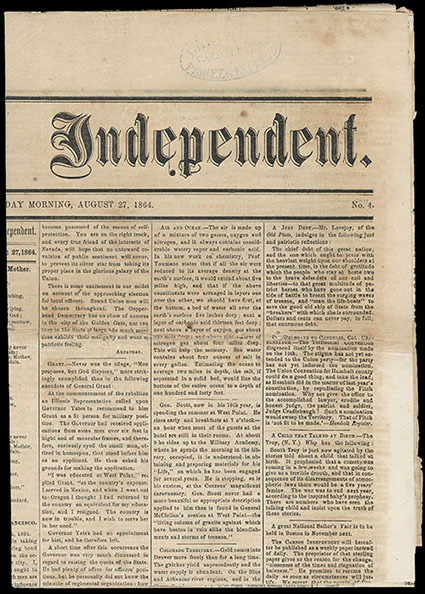 Langton's Pioneer Express, Carson City, light but clear strike of blue oval handstamp on August 27th 1864 "Carson Weekly Independent" newspaper, folded in half, F.-V.F. and scarce newspaper express use. Langton's Pioneer Express from "Unionville N.T. ", black on yellow label with manuscript town designation, affixed on blue linen-lined legal-size cover to San Francisco, manuscript "Coll" at top right with some pencil numbers; cover faults, Fine and scarce label. 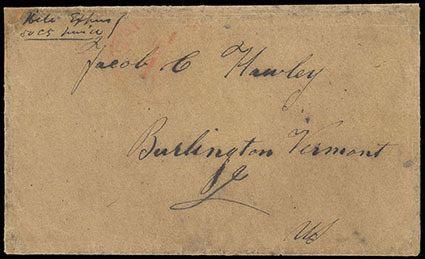 "Nels Express, 50cts Paid", manuscript endorsement at top left of buff cover to Burlington Vt., entered mails with red "San Francisco '40' Jun 1" integral-due cds, original letter which no longer accompanies was datelined "Foster Bar, California, May 10, 1850" and refers to expressman; upper left corner repair and edge wear reinforced, F.-V.F. appearance. Nels Express was probably one of the typical one-man Expresses that operated in the California Gold Country. Many of the Argonauts would become express-men to support their friends and partners in the mines. Nels mad at least one express run down the river to San Francisco. Nelson A. Hammond was a pioneer stagecoach employee and later worked for Wells, Fargo & Co. in 1865, at Dutch Flat-Alta in 1866, Cisco 1868 and Reno 1869. He organized the Hammond & Wilson Express at Reno. 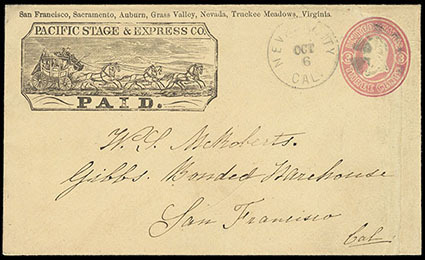 Pacific Stage & Express Co., printed Paid frank illustrated with six-horse stagecoach and line of text at top that lists their principal offices in California and Nevada, this variant exists on westbound uses, on 3¢ pink (U35) buff entire to San Francisco Cal., entered the mails with "Nevada City, Cal. Oct " cds duplex; reduced at right into indicia and restored, Very Fine appearance. Thomas No. PAS-002 Estimate $1,000 - 1,500. 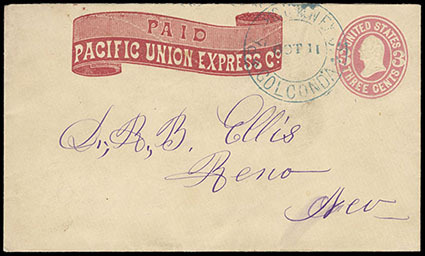 ONE OF ONLY FOUR RECORDED EXAMPLES OF THIS PACIFIC STAGE & EXPRESS CO. FRANK. Pacific Stage & Express Co. was operated by James McCue and Michael Rees between 1860 and 1864. It ran between San Francisco and Sacramento, to Virginia City, Nevada. This express operated through the Henness Pass north of Lake Tahoe to Virginia City. It operated from this terminus of the Central Pacific Railroad as it pushed through the Sierras to Virginia City. 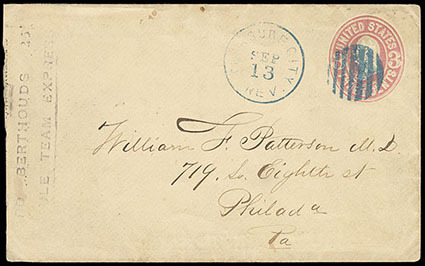 Pacific Union Express Golconda (Nevada), blue "Oct 11" double circle datestamp on red franked 3¢ pink entire to Reno, Very Fine and choice. 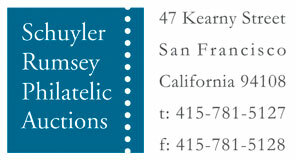 Believed to be the finer of two known examples of this style datestamp.